The Hugo Boss Touch smartwatch, running Android Wear 2.0, has been unveiled at a very busy Baselworld 2017. The designer watch was announced alongside the Movado Connect and Tommy Hilfiger TH24/7You at the event in Switzerland, and follows last year's Hugo Boss Smart Classic hybrid watch - a tentative but classy first effort that tested well. Here's what we know so far - the Hugo Boss Touch is constructed of carbon black IP stainless steel and there will be a range of interchangeable straps to mix and match with the five unique digital watch faces the luxury brand has designed. NFC is built in, so Android Pay from your wrist will be an option. We can also confirm that there's no heart rate monitor on board. On a fashion-focused smartwatch we'd argue that's a good thing - we stated recently in our hands-on review of the Montblanc Summit that an optical HRM on a stylish smartwatch just adds unnecessary bulk. Hugo Boss watches and accessories are made by Movado, which explains the batch of launches, much like Fossil Group's much larger cohort of new designer smartwatches: the Diesel On, Emporio Armani Connected and Michael Kors Access Grayson & Sofie to name but a few. Stay tuned for first impressions of the Hugo Boss Touch from Baselworld. 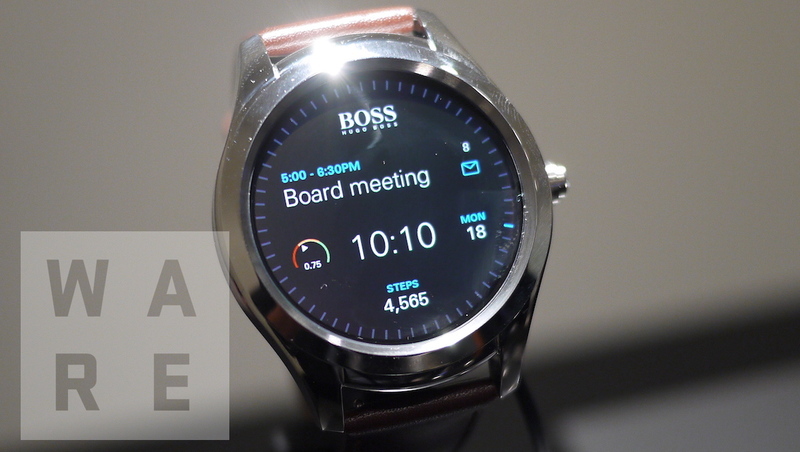 The smartwatch will go on sale in August for $395.